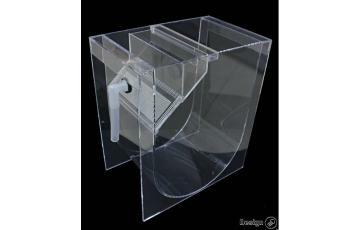 Breeding aquariums are specifically designed to ensure a safe breeding environment. Thanks to the round edges there is a constant mild water flow which helps the jellyfish to float lightly. There is also a built-in partition from the drainage to the filtration used to protect the jellyfish from being sucked into the filtration. 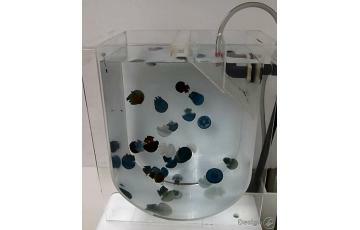 This type of aquarium can be used in aquatic stores as a selling tank. They also look great in households as built-in jellyfish aquariums. After illuminating the aquarium, the jellyfish absorb all colours with their bodies. It is truly fascinating to look at them. 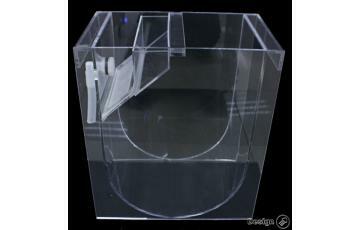 Kč 25,220 Jellyfish aquariums used for breeding – size L (95 litres) The 95-litre breeding aquarium is made..
Kč 19,910 Jellyfish aquariums used for breeding – size M (35 litres) The 35-litre breeding aquarium is made..
Kč 14,720 Jellyfish aquariums used for breeding – size S (17 litres) The 17-litre breeding aquarium is made..